Quirky founder Ben Kaufman (center) announced the Mattel partnership on Thursday. Got a great toy idea? Mattel wants to hear from you. The El Segundo, Calif.-based company behind iconic toys like Barbie, Hot Wheels and American Girl hopes someone in the general public will think of the Next Big Thing. Mattel (MAT) is teaming up with Quirky, a crowdsourcing platform for inventors that lets anyone submit an idea, as the toymaker struggles with lackluster sales. The site has previously landed products with Costco (COST), Home Depot (HD), Amazon (AMZN) and Bed, Bath & Beyond. Related: Remember these creepy talking toys? 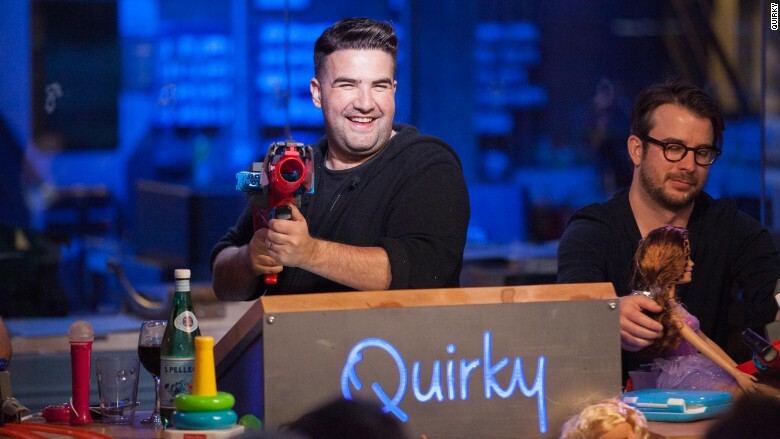 Quirky's community of 1.5 million registered inventors will vote on the best ideas, which then will be jointly developed by the two companies and on store shelves in time for the 2015 holiday season. Inventors whose ideas are selected earn 3.5 % in royalties. Even kids will be able to submit their ideas as soon as a Quirky policy change takes effect. The initiative kicked off late Thursday, and Quirky founder Ben Kaufman is confident that he'll have hundreds of ideas by the end of Friday. "Toys are one of our most popular categories," he said, adding that the platform has gotten 15,000 toy-related ideas from its community since it launched in 2009. "But we now have the right partnership with Mattel to quickly commercialize some of these toy inventions," he said.